Food industry is one which has been very successful. There is self regulation where there are stringent standards required and must be met for supply of products and services (e.g. HACCP in the food supply chain) or unenforced industry regulation where one interprets any standard or policies in a way that best suits the individual. 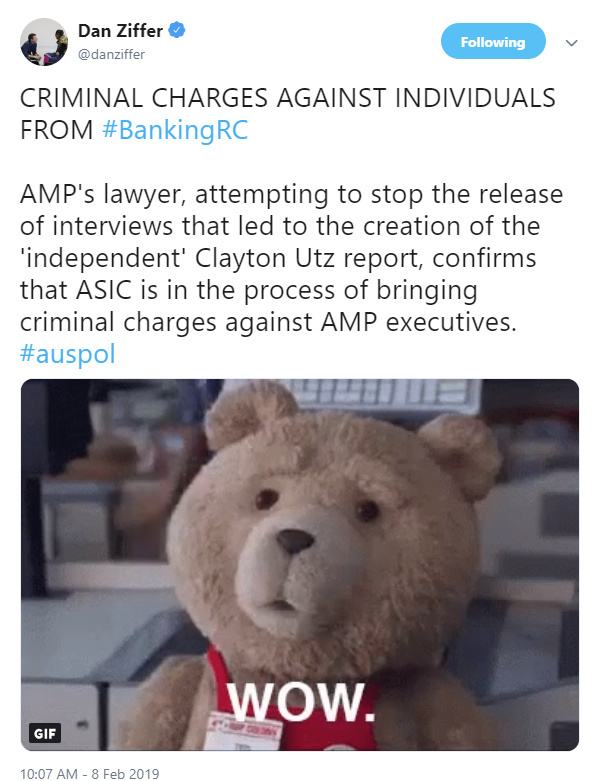 The later possibly being the banking industry where there is regulation, but the regulator (ASIC and APRA) has not enforced the regulations…and allowed the industry to do its own thing as long as there was not seen to be a problem. This is not self regulation but letting the mice play until someone gets hurt. Since RC, Bank shares have fallen dramatically with substantial losses to investors? Shares in Banks had a big gain in the market as a result of the Commission report. It was all in all a wonderful landing for them with perhaps the clients being well and truly dumped on from a great height. It was all a mistake. Nothing to see here. our banks have acknowledged that we have not always got it right, and have made mistakes. 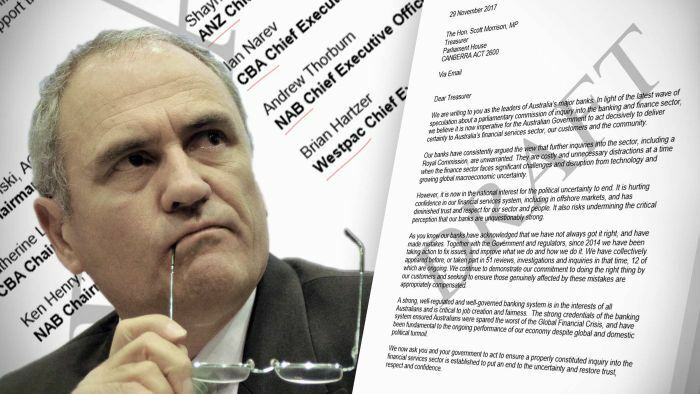 When the heads of the big four banks wrote to the Federal Government, reluctantly calling for a royal commission into their industry, they asked the Treasurer to vet a draft of their letter, documents released under Freedom of Information reveal. The report is about as lightly lightly as they could get away with, as expected. Who would have thought (drum roll)there could be a leak, and interviewers clever enough to avoid asking about one excepting to the banks. As for winking to ‘not banks’, the question was neither asked not answered, apparently. 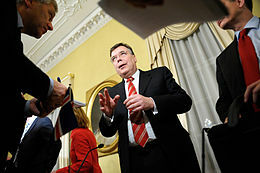 Will there be more about insider trading and leaks to come? nb. A reporter never crosses a coalition government and is well practised in where to draw the line. "In our view, a properly constituted inquiry must have several significant characteristics. It should be led by an eminent and respected ex-judicial officer. Its terms of reference should be thoughtfully drafted and free of political influence. Its scope should be sufficient to cover the community’s core concerns which include banking, insurance, superannuation and non-ADI [authorised deposit-taking institution] finance providers. "Further to avoid confusion and inconsistency, the inquiry must to the most practical extent replace other ongoing inquiries. "It is vital that the terms of any inquiry consider the many reviews and inquiries that have been conducted into the banking sector in recent years; the significant government and industry-led reforms that have been and will shortly be implemented; the 44 recommendations made in the Financial System Inquiry in 2014; and the broad and positive contribution that banks make to the Australian economy and to millions of customers and shareholders. No threats implicit in the last item. This draft letter raises some serious concerns about how close the banks were to the government in developing the Royal Commission’s terms of reference, and the link by @TheBBG to Michael Pascoe’s article about insider trading (good to see Pascoe is still around and still writing) raises even more concerns about the whole inquiry. WHEREAS Australia has one of the strongest and most stable banking, superannuation and financial services industries in the world, which performs a critical role in underpinning the Australian economy. AND Australia’s banking system is systematically strong with internationally recognised and world’s best prudential regulation and oversight. That’s not putting much pressure on the Commissioner, is it? Spells out the rules quite nicely, while the last four clauses say ‘and be quick about it’. One is left wondering if this is the Royal Commission for the Banking Industry. Certain non-bank institutions have lost out big-time, while the banks are sitting fairly comfortably - with the exception of some possible lawsuits that will no doubt be vigorously defended with their shareholders’ money. Looks like nothing much has changed with the grubby banks. 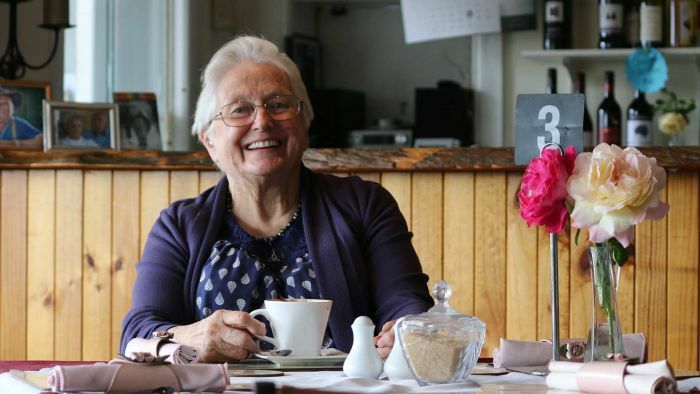 The Lachlan Hotel has stood for 100 years in a small Tasmanian town, but the lessees might call last drinks on Sunday. What do they care if a small town is left in the lurch? The heads have started to roll. The banking royal commission takes its two biggest scalps with NAB chief executive Andrew Thorburn and chair Ken Henry to leave the bank. How on earth did you read my post and reply to in an instant? Gotta be quick around here. Westpac promises change after the Banking RC, then shuts 22 branches. Some big news regarding AMP. 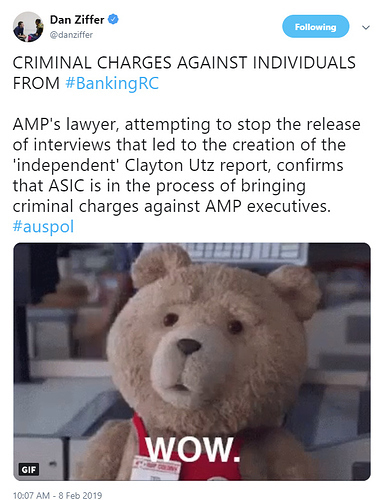 Hopefully AMP is not using shareholders funds to pay for this legal action. Nor the defence of any legal actions brought against AMP management or directors. On ABC radio World Today 8th Feb, NAB shareholder Chris Schott (past ALP Senator) expressed the view that it would be unacceptable for NAB to pay the legal expenses of NAB directors. 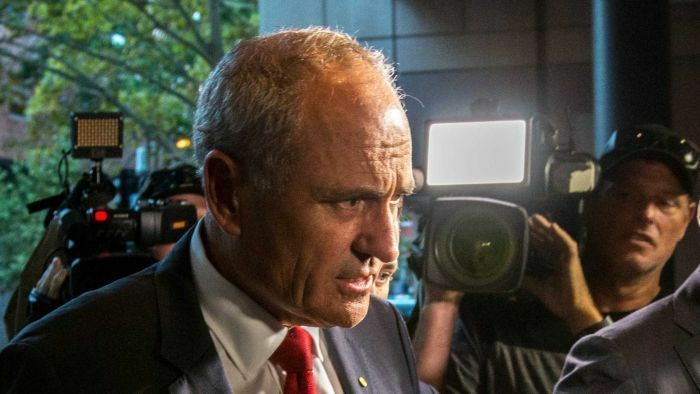 He also made a case for the entire NAB board to be replaced, and Ken Henry the Chair to depart rather than stay on short term. The significant point made was Henry should not be selecting the next NAB CEO. It should be Henry’s replacement that has the opportunity to lead and own the board choice of the new CEO! 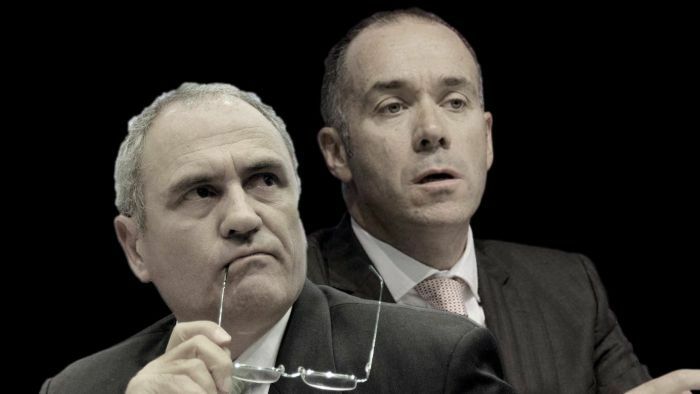 With the balance of the current NAB board holding onto their positions and being key participants in all the past key NAB corporate decisions, it’s understandable that some shareholders might be asking for more than the current two resignations. Does changing just the Captain and First Mate on a pirate ship make it anything different? Perhaps not when the departing Captain and pirate crew has a hand in choosing the replacements? P.S. for the record, I do have a financial interest in the performance of AMP, and financial interest as a customer of NAB. Another “good news” bank story. If there is one thing NAB has excelled at in the past 20 years, it is finding itself trouble. So are the billions blown and reputations destroyed bad luck or bad management? Of course they’ll use shareholder funds. It would ‘set a bad precedent’ not to defend one’s employees - as long as they are/were senior managers. Heads can roll down the line, but I expect every financial institution that has senior managers appear in courts will defend them with the best legal teams (shareholder) money can buy. The government has released its own response to the Royal Commission - sorry I’m a bit late on this but they released it on 04 February. I have yet to read it all, but see that the first sentence of the first paragraph after the foreword takes the opportunity to ‘blame the guys we replaced’. How infantile. No mention of how long the government resisted the Royal Commission - until the banks stepped in with their own prodding. The RC recommendations and government response start on page 6, and do not fill this particular reader with confidence. The devil will be in the details. I suspect that the details will be very - well, detailed - and incomprehensible to the average layperson. In the meantime, interest will no doubt have moved on to the latest public personage’s peccadilloes. Increased costs of banking - all additional cost/ any fines /penalties to the banks WILL be passed onto their customers, (Gov Depts, business and private - eg. fees and interest rate rises) and they will have to pay. Just think, can your salary (or even welfare) be paid in cash any more - NO (infact businesses have to pay the banks to handle your salary). There is probably dozens of other concerns, State and Fed Govs are trying to currently work through looking at impacts to themselves and others. Could there be a problem with the listed concerns? Does everyone suffer equally? It might be suggesting that we should accept the banks taking advantage of us because it comes back to us in returns through our super. The return to many of us may be relatively minor, compared to what we loose. There are many more investors in the banks than just super funds. Many investors are not bank customers in the same way as the majority of us, and therefore are not paying a cost in excessive fees or unfair terms and conditions. And for those wealthier investors any banking costs that are accrued are probably fully tax deductible due to the way a business, trustee companies and trust funds can be managed. For those of us with reasonable super balances, we might see some return. There are perhaps just as many customers who pay at the customer end, but gain little return due to nil or low super balances. Which should concern us most? Our own greed, or honesty and fairness? And yet another article regarding the grubby NAB. 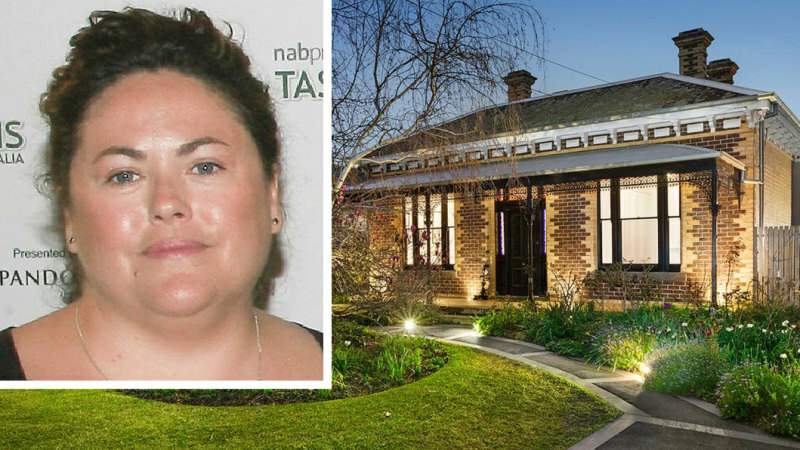 Police have frozen assets of Andrew Thorburn's chief of staff Rosemary Rogers including a $1 million NAB cheque and $6.3 million property porftolio. Oh dear. So sad, too bad. Isn’t that what they said to their victims, oops, customers? I am sure they are looking as hard as they can to do as little as possible, and hence keep the banks among the most profitable in the world, and creating a few guilty parties among the many who will take the falls. I find that an interesting perspective. Is what you wrote really that since some of their profit has been ill-begotten they still deserve and need to be ‘that profitable’ and it will be OK for them to jack up other fees or develop new ones to compensate? It is not as if they do not already charge among the highest prices/margins in the world from account keeping to poor exchange rates to selling financial products. As I wrote, it is somewhat on the investors as well as the super funds for their decades long wink wink, and since the retirement system is evolving to rely on the free market and its greedy participants (more so?) than honest enterprises it is a problem of its own making. One conclusion is that the entire super concept is faulty when those responsible do not take an active interest in the business conduct of their ‘investments’, only the share prices and dividends they bank. Fixing it is certainly a catch-22. Just like in the GFC and the banking businesses that were deemed “too big to fail” we now have a too softly approach to the avarice of those in positions of power in finance. We need to have done what Iceland did and criminally dealt with those “leaders” and while it would be painful for most of us the longer term outcome of dealing strictly with this sort of behaviour is it would bring better accountability of those in these positions and thus better outcomes going forward. How did Iceland clean up its banks? What can we learn from Iceland, where the economy is bouncing back after the financial crisis?